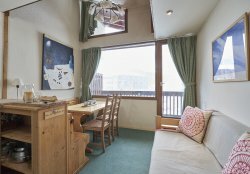 1st floor apartment with 2 bedrooms = double en-suite with WC, 1 x twin room with an en-suite shower, separate WC, open plan living/kitchen/dining, sofa bed in the living for 2 people, balcony, underground parking for 1 vehicle, ski room. 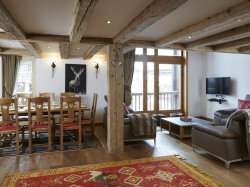 Apartment with 2 bedrooms = double en-suite with WC, 1 x twin room with an en-suite shower, separate WC, open plan living/kitchen/dining, balcony, underground parking for 1 vehicle, free Wi-Fi, UK free view TV, ski room with boot warmer. Twin bedroom (beds can push together with double duvet for double) with en-suite (no WC), twin bedroom, separate shower room, 1 separate WC, open plan living/new kitchen/dining, balcony, parking. 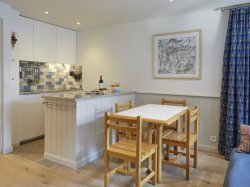 1 double bedroom with en-suite shower, 2nd bathroom, separate WC, open plan living/kitchen/dining with double sofa bed bed, 'coin montagne' (built in double) off living room. Newly refurbished, very smart apartment with 1 king double bedroom, open plan living with sofa bed, dining & kitchen, bathroom including WC, balcony. 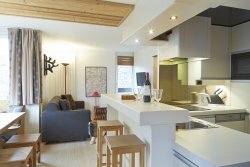 Duplex property on the 1st and ground floors with 6 bedrooms all with en-suite bathrooms (5 with WC’s), 2 additional WC’s, open plan living/kitchen/dining, small sauna with separate shower, underground parking for 2 vehicles, ski room with boot warmers. This property is for sale exclusively with our estate agency 4 Property. For information click on the link below the pictures to view reference 4P420. 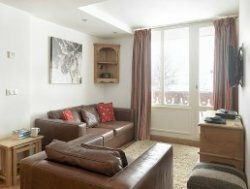 1 double bedroom, double sofa bed in living, separate kitchen, open plan living/dining, bathroom including WC, small balcony. Duplex property on the 1st and 2nd floors with 4 bedrooms (1 master, 2 x twins and 1 triple room) all with en-suite bathrooms with WC’s. 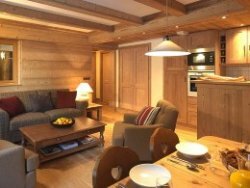 Open plan living/kitchen/dining, balconies with views up the Bellevarde mountain sector, underground parking for 2 vehicles, ski room with boot warmers, UK Sky TV (weather permitting, snow affects signal), wi-fi. 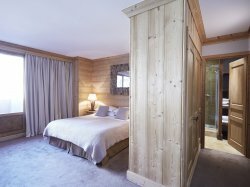 4 bedrooms all en-suite, open plan living/kitchen/dining, balcony with mountain view, ski locker, parking. Competitive price for 4 bedrooms en-suite with good living space. 9th person possible, available on request. Duplex property on the 2nd and 3rd floors with 3 bedrooms = double en-suite with seperate en-suite WC, 2 x twins sharing an en-suite shower with WC, separate additional WC, open plan living/kitchen/ dining, balconies, underground parking, ski room. 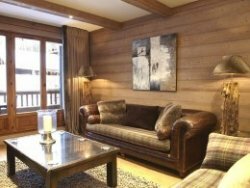 2nd floor apartment with 3 bedrooms = double en-suite with WC, twin bedroom with separate shower room & WC and a cabine bunk room. 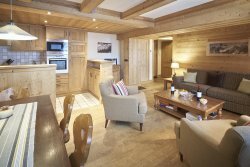 Open plan living/ kitchen/dining area, balcony, underground parking, ski room, lift. free Wi-Fi and UK satellite TV. 1 king double bedroom, 1 bunk room with window, bathroom with bath, glass panel & rain shower, separate WC, open plan living/kitchen/dining with balconies. 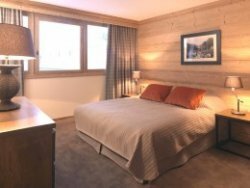 2 bedroom, 3rd floor apartment with 1 double, 1 bunk cabine (with door and window), sleeping for two in the living room, bathroom, separate WC, open plan living/kitchen/dining, balcony, ski locker. 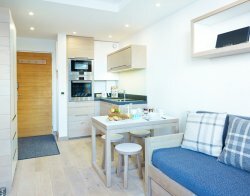 Clean well decorated apartment, Free Wi-Fi. 2 floors including 1 double bed on open plan top floor with sitting room one end and sleeping the other, bedroom with double bed & single bunk above, open plan kitchen/dining with sofa and 2nd sitting area, bathroom with separate WC.